Great WINTER PARTIAL SEASONAL DEAL for ONLY $2500! First floor, grade level 1200 square foot Log Apartment with own wood burning stove! Private entrance! House in great location, Less than 1 mile from Okemo Base lodge! 100% REFUND up until 60 days before. GREAT PARTIAL SEASON for NYE + Jan & Feb Available - REDUCED to $2.5k . If individual $1400 / monthly!! $2500 for 2 months! GREAT DEAL. Located on lovely, private, one acre wooded lot RIGHT on Okemo Mountain... Excellent value for the location - less than 1 mile to the original base lodge. Avoid Rt. 103 traffic at end of day, via a backroad to house (Upper Cross Rd). PLENTY of parking; 3 bedroom/ 1 bath 1200 square foot log cabin apartment. Spacious and comfortably decorated on 1 flat level; very updated. No guest ever dissatisfied. Some guest comments we have received over the last year include: 'When you walk in, this seasonal home gives you a big hug!!' 'What a wonderful and inviting home'; 'We LOVED the wood burning stove'; Others have used the Queen Futon which can turn into a queen bed, as well as the love/ seat couch or huge comfortable king ottoman chair as additional sleeping space. (Also have a pull out trundle bed in twin bed room). MOST UTILITIES are included in these great deals/ costs!!! (Wood, Plowing, Water, Cable, Internet Wifi, Phone); Only Propane and Electric separate for partial seasonal. Also included within price of rental: Additional outdoor secure locked storage shed available for tenant's use for ski's or snowboards! ONLY 50% due now to HOLD. Balance due 60 days before! IF PAID IN FULL ADDITIONAL DISCOUNTS GIVEN! 100% REFUND if 60 days before. Family of 5 bought in Nov, 2005, and have raised their kids here. Taught them skiing at Okemo. swimming at Echo lake, apple picking in Springfield, etc. Incredible year round vacation destination; In the winter there is obviously the skiing, snowboarding, ice skating, sledding, and wonderful other outdoor activities. In the summer and fall - swimming, hiking, golf, waterfalls all nearby! Local shops, cuisine, maple ice cream at Maple Sugar House, shopping at VT country store, hanging out in front of house on 1 acre wooded private lot with a fire pit! Bathroom has been recently updated in 2013, and has a full tub and shower! Less than 1 mile from okemo resort! Propane heat available; and electric baseboard in each room also available with separate thermostats. Beautiful wood burning stove right in living room. Located on lovely, one acre wooded lot on Okemo Mountain. Three bedroom, 1 bath log cabin is a 1200 square foot apartment with many amenities. Spacious and comfortably decorated all on 1 level; very updated. Cozy living room and kitchen area; Spring/ Summer 2013 enhancements included new dining room furniture, updating the bathroom, new stove and new queen bed in Master Bedroom. Winter 2014 - new Queen Futon for living room. Past enhancements were: new love-seat couch, new propane heater, a cozy large king ottoman chair; wireless internet access throughout log apartment, new light fixtures, and new kitchen pots, pans, etc. Summer 2008 enhancements included upgrading bathroom - new fixtures and plumbing. Incredible new tub,shower and amenities. Summer 2010 upgrades include new bedroom furniture and new flat screen TV / DVD in full bedroom room. Summer 2011 - New stove, new painting throughout unit. Great location and great experience! This was the perfect spot for our family -and sometimes friends too 😊�. 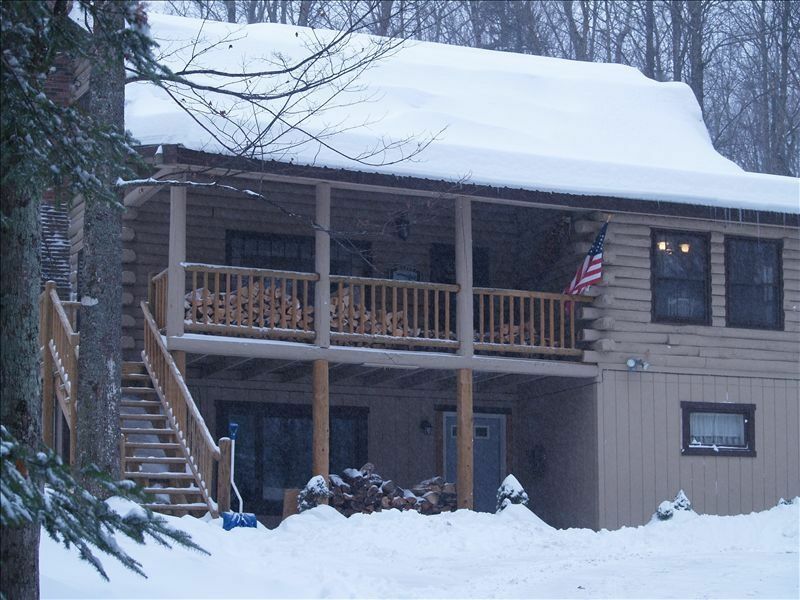 Cabin sleeps 6-8 and has everything you need for a cozy ski getaway! Great location -within minutes of the base of Okemo and Jackson Gore. We will be back for sure! (Okemo Valley, Just 1.5 Miles Away), Antiques, Horseback Riding, Shopping & More. Foliage Season Is Also A Spectacular Time To Stay At Our Place. Just Minutes to Okemo Base Lodge, & Within 30-40 Minutes of Killington, Stratton & Bromley. Perfect For Snowmobilers with Easy Access to Vast & on 1 Wooded Acre. Great Seasonal options available. Holiday rates or partial seasonal packages deal options for the 2014-2015 year. Plus 7 night, 5 night and 3 night holiday packages also available, so inquire within. Holiday timeframe's are: Xmas, NYE 2014, MLK 2014, and President's weekend and Feb break week in Feb 2015.